Computer running slow? Security pop up windows? Annoying popup security scans and error messages? Is the FBI or Department of Justice holding your computer hostage? Hard drive delete or data erase ransom messages? Meesages prompting you to call a “microsoft tech support”? Lightspeeds PC Repair Augusta GA specializes in completely and safely removing all types of computer viruses, malware and the FBI virus infection. A computer virus can infect ones computer in a variety of ways, usually after opening Internet emails, email attachments of unknown origin. The simple act of surfing the internet can be enough to cause this kind of problem your computer to malfunction. Even with the best virus protection money can buy, a virus can sneak its way into your PC, blind-fold all your protection, and carry out a virus attack on your computer resulting in compete down time. 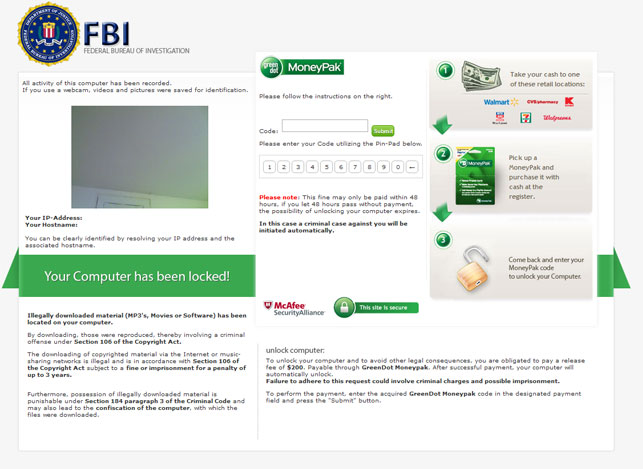 A bad piece of “ransomeware” going around the last several months is the FBI MoneyPak virus, known as “ransomware”. Don’t worry it is fake, but it does make some think twice and fools many people. This infection DOES lock your computer completely down with a full page FBI graphic background, and renders your computer useless. The FBI or Department Of Justice virus will not lock your computer down and demand you go to Walgreens or Walmart to get money to unlock your computer. Non the less, the FBI virus is becoming one nasty virus hitting MANY computer users around here. Lightspeeds Computer Repair Augusta GA is a self-operated, locally owned computer repair service located in Evans, Augusta Georgia. iDrive – FREE 5GB Automatic Data Backup Account. Sign up today and begin backing your data up automatically. No credit card needed. 5 gigabyte offsite backup account is completely free with no expiration. Never again worry about your important data on your computer again. Data recovery is simple and quick!